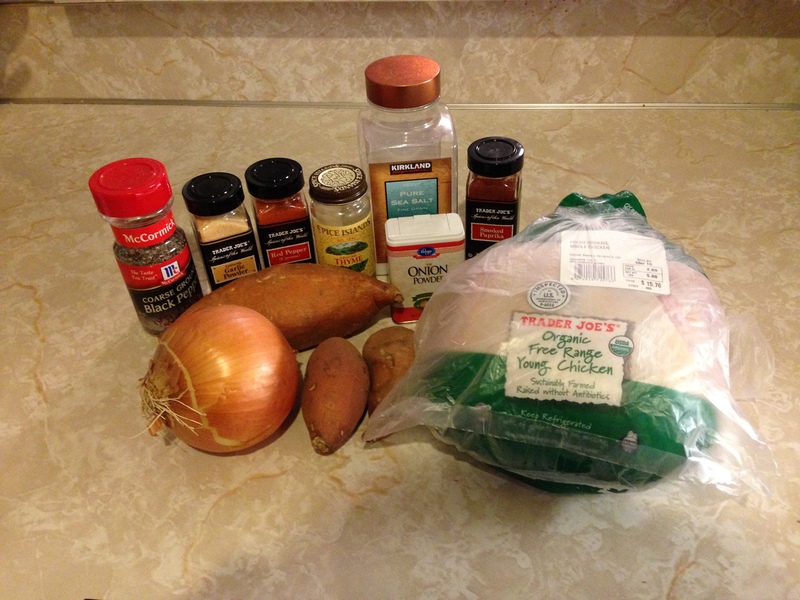 Sunday Roast Chicken with Sweet Potatoes in the slow-cooker PLUS homemade chicken stock! 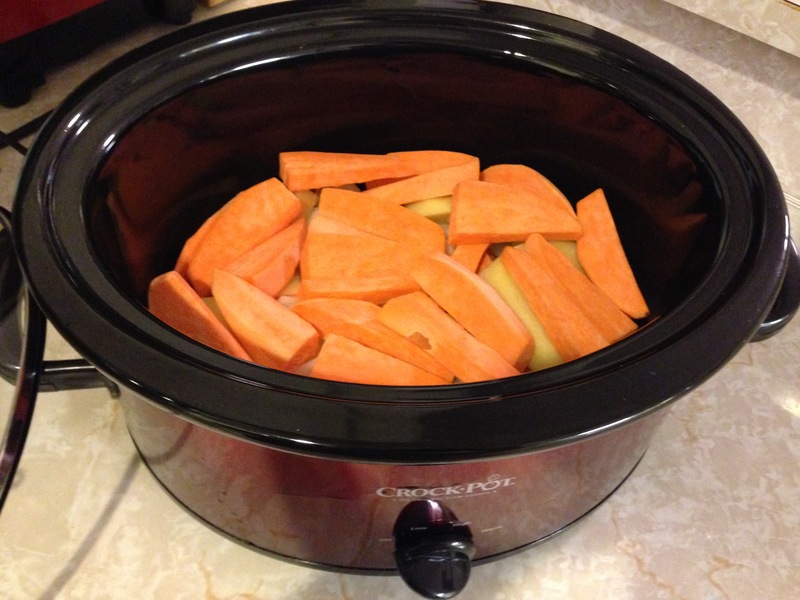 Loosely chop the onion and place it in the bottom of a 6-quart slow cooker. Cut potatoes into wedges and place on top of onions. 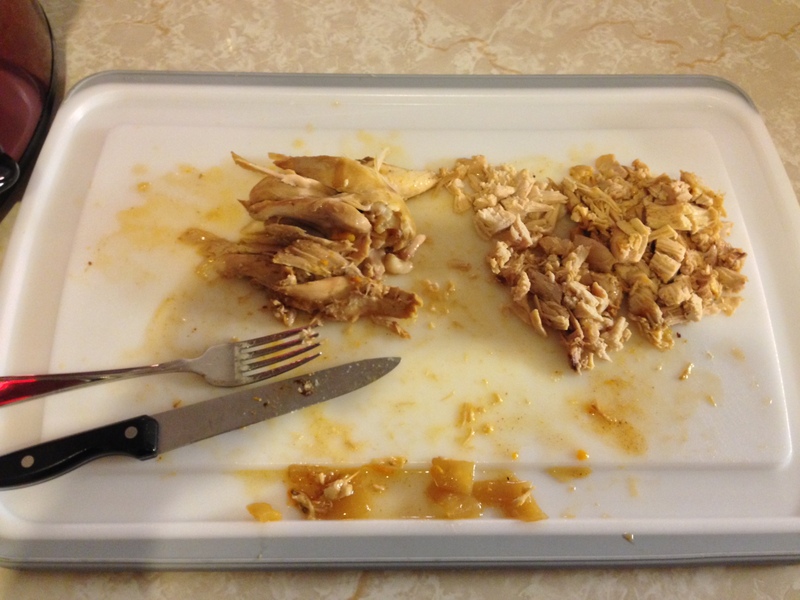 Remove any giblets from the chicken and then rub the spice mixture all over. You can even put spices inside the cavity and under the skin of the breasts. The dark spices like paprika and cayenne help give the chicken “roasted” color, as well as fantastic flavor. 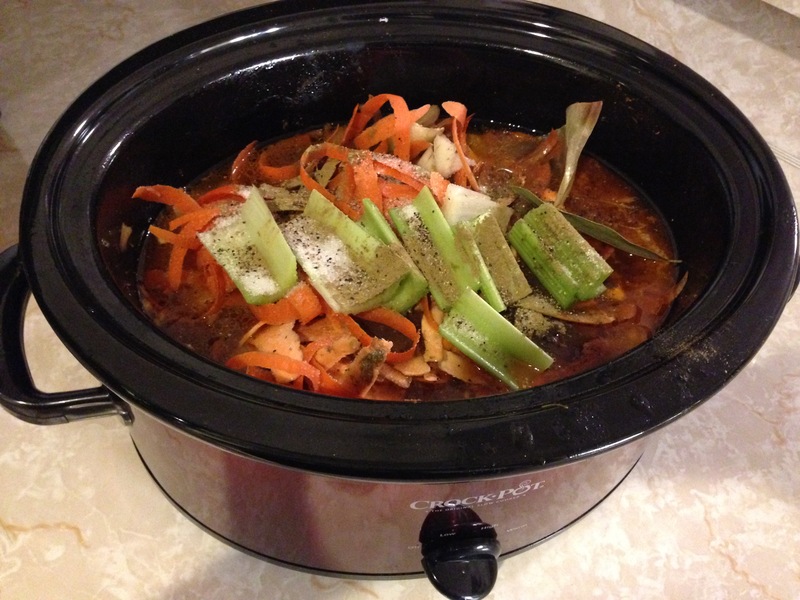 Put prepared chicken on top of the veggies in slow-cooker and cover it. No need to add liquid. Cook for 5 hours on high, or 8 hours on low, until the chicken is falling off the bone or internal temperature reaches 165 degrees. 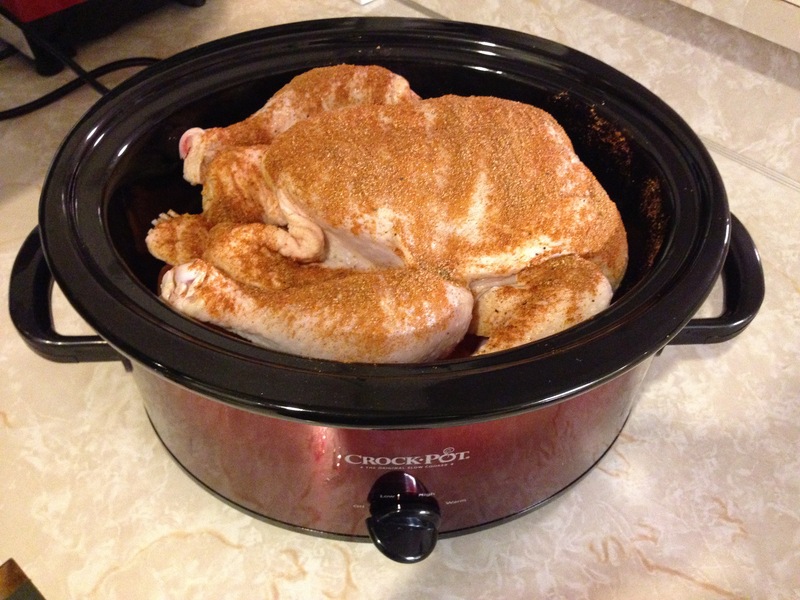 Don’t let anyone tell you that raw chicken doesn’t cook thoroughly in a slow-cooker. This is the result of 8 hours on low! 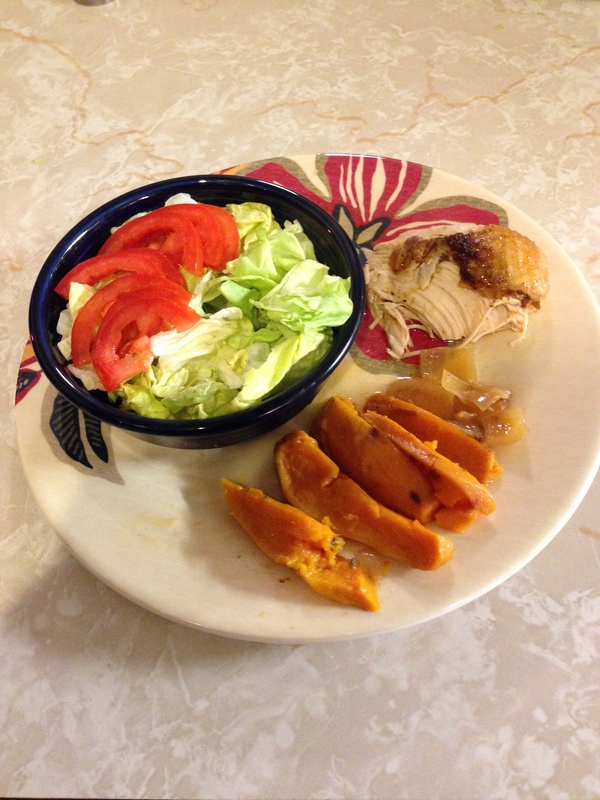 Serve the chicken with the sweet potatoes (and the onions if you like) and tossed green salad. After dinner, and before making the stock, pull all remaining meat off the bones. Chop it into small bite-size pieces. This helps make sure you don’t get bones. 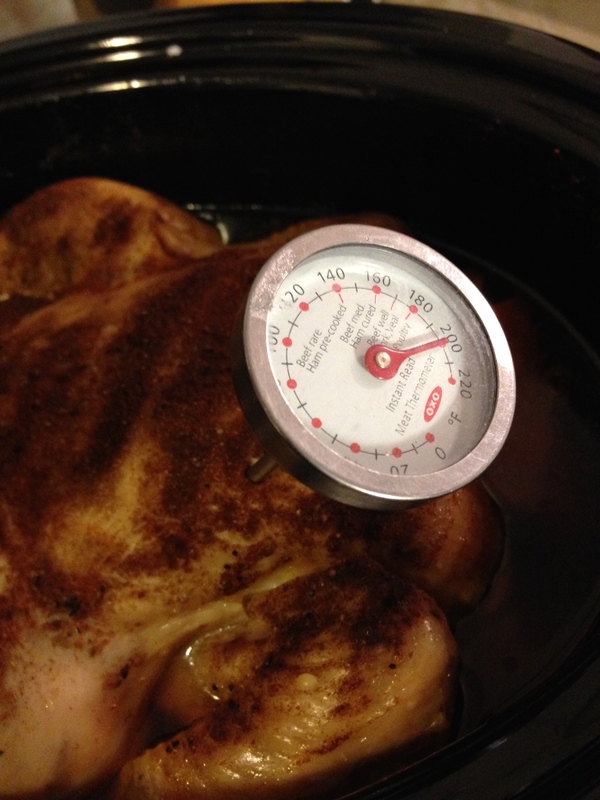 Freeze this chicken in one- or two-cup containers, labeled with the date and amount. Follow the instructions for homemade chicken stock. 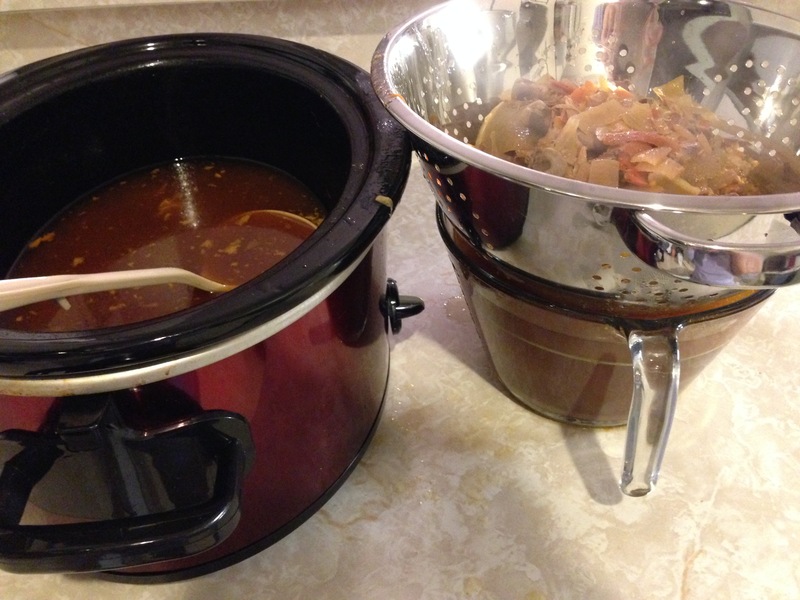 Leave the bones and leftover onion in the crockpot. Fill it to the top with water. Add a dried bay leaf, 2 sticks of rough-chopped celery, a teaspoon of dried thyme, and the scraps from prepping the veggies (potato peels, onion ends). Add 2 teaspoons salt and 1 teaspoon pepper. In the morning, strain it, tossing the bones and bits. 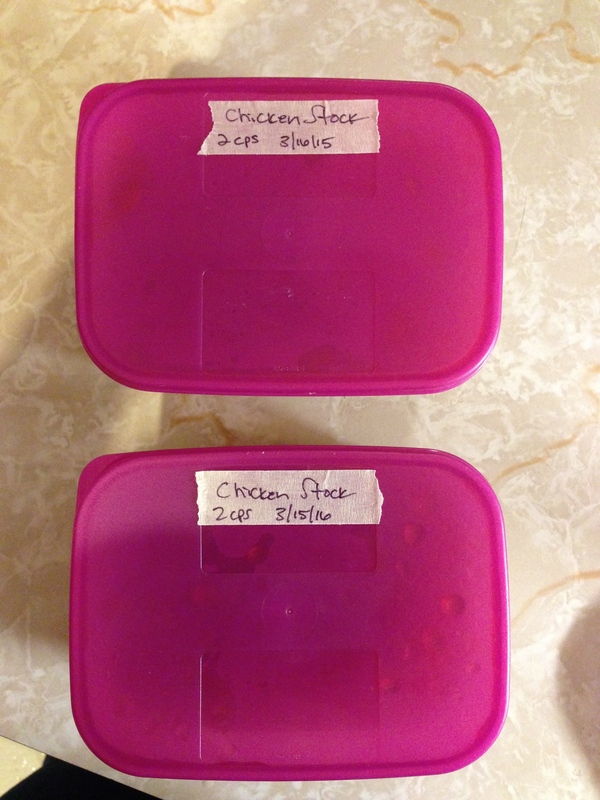 Measure out stock into one- or two-cup containers labeled “chicken stock”, the amount, the date, and freeze for later use. You, my friend, are a kitchen rock star! 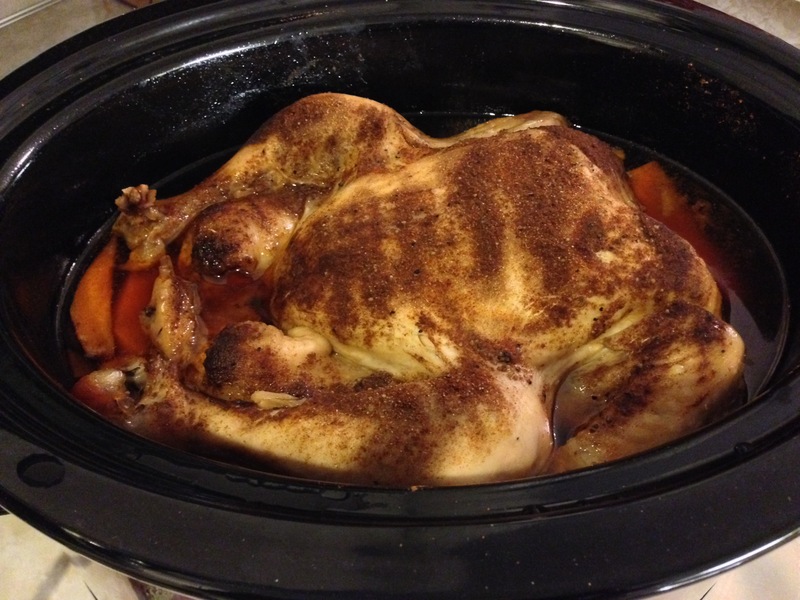 This entry was posted in Food, Healthy, Homemade, Ingredients, Recipes and tagged crock-pot, homemade, make ahead, organic, organic chicken, overnight, plan ahead, slow-cooker. Bookmark the permalink. We made this and loved it! After the first meal of Chicken, sweet potatoes and salad, I made a big pot of soup with lots of yummy vegetables, sprouted lentils and beans. Super easy! 🙂 We loved the soup with the leftover sweet potatoes in it. There are only two of us, so after three nights of soup, the rest will go in the freezer! And I still have enough chicken left for a pan of Healthy Fried “rice” that we make with Quinoa and riced cauliflower. It was a busy week so having the soup ready has been nice and I am blessed to have a husband that doesn’t mind leftovers!! Teresa, thank you! It’s so good to know you and your husband ate so well from one roasted chicken. Leftovers are great when they don’t look like leftovers, right?